Its' a great idea, wonderful and congratulations for this. This is a favorite tradition at our Thanksgiving (and any family get-together really) every year. Instead of mixing the jello with cool whip we use mayonnaise. Sounds nasty, but tastes so yummy!! 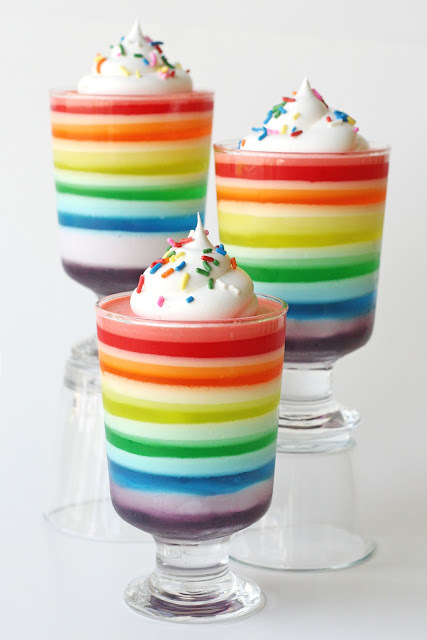 I've been making rainbow jello for special occasions and holidays for almost 20 years, having seen the recipe originally in a Susan Branch cookbook. Now my kids, 19 and 22, don't think it's a holiday without it. Of course, I change up the color combo depending on the occasion – Christmas was of course red and green. Yours, in the ultra thin layers in a glass, are beautiful! Did you pour the liquid jello on top of the already set jello in the cups? Where did you get the glasses, and how many ounces are they? I was wondering about the cups too. I think they are glass but was wondering how many ounces they are and where they were purchased. Thanks!!! The glasses shown are about 12 oz glasses I bought at a discount shop a while back. This dessert could be made in most any size glass or plastic cups. How large is the glass you used?? About how many glasses did this make? I'm thinking of trying to make this for my daughter's preschool class and wanted to know how many boxes of jello this would take. So I read how you did the purple layer, but how did you do the rest of the layers? Did you pour the liquid on top of the cool whip each time? Or did you just do the first layer in the cup. Thanks for more info! After you put the coolwhip layer down, so you have to put it back in the fridge for another 15 min, or can you go on to the next step right away? Yes, between each layer (including the cool whip layer), it needs to be chilled to set up. It does take quite a bit of time to make this… but the results are so fun! 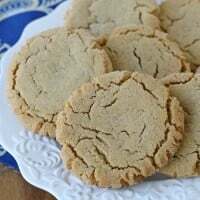 Fabulous recipe and presentation! Used these for our Canada Day party today :). Thanks again! Hi, I am going to do this for my daughter’s birthday.. just wondering how many cups this makes? I saw that you used 12 ounce cups, but am trying to figure out if I need to double or triple the recipe. Thanks!! Yvette, Take a look at the jello boxes and see how much water is need for the “quick chill” method. Take that amount and multiply by the number of colors (in this case 6). This will give you a base to work off of. The Cool whip will add some additional volume, but I think just figuring out how many ounces of jello will give you a good idea. Then figure out how many ounces the cups you plan to use will hold, and you’ll know how many batches to make. 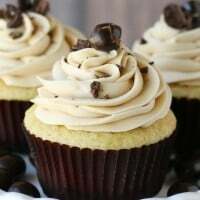 I’m excited to make these for our party on Saturday. I’m using whole milk yogurt…how far ahead do you think I can make it? Is Wed or Thursday too soon for a Saturday morning party? Thanks! I think it would be fine to make them a few days in advance. Just make sure you don’t have any strong odors in your fridge that may make their way into the jello. 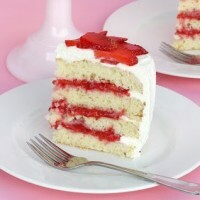 I am making these and for some reason when I prepare the cool whip layer I come up short? I’m not sure what you mean? What size dish/dishes are you using? 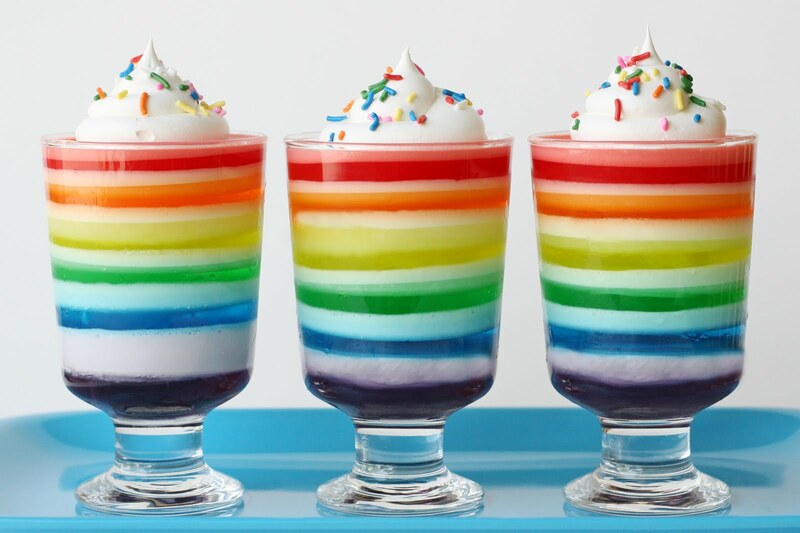 Do you not have enough cool whip layer to fill the glasses or cups you already put a layer of jello in? The cool whip/jello layer will be thinner than the plain jello layer. Is the cool whip still frozen or thawed? Hi! I made these treats last week for my daughter’s preschool class. I LOVE how they turned out but they were definitely too much effort for me! Thanks for the idea though! I do a similar thing with Jello EVERY year for Thanksgiving. Started it when my kids were young, and it’s become a tradition. I spray the inside of a bundt pan with cooking spray (or you can coat it with a thin layer of mayo) so the jello will come out easily when finished. I do two layers for each color, the first of which is just a box of jello with 1 cup hot water. Chill in fridge for at least 30 min. After about 20 min., mix the second layer up, so it can cool slightly before pouring onto the previous layer. In the second layer, I mix in 2 Tbsp. 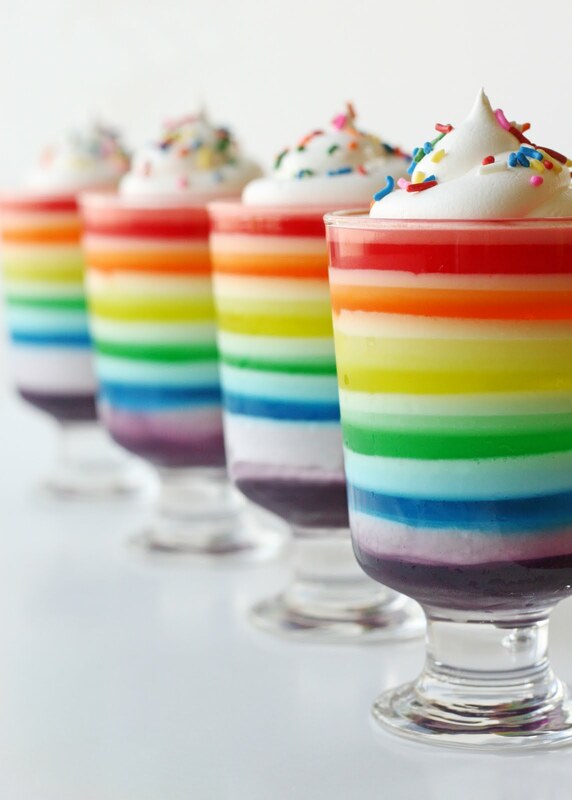 of cream cheese with a whisk, Repeat with each color, just remember to do it in the order that you want from top to bottom(since you’re going to invert the pan when finished) So, 2 of each, red, orange, yellow, green, blue, and purple. I have to do this on Wed. before Thanksgiving, and leave it overnight in the fridge. Thanksgiving morning, I run a warm wet rag over the bottom of the pan, then invert it onto a pretty plate! What comes out is the most beautiful rainbow ring you’ve ever seen! And when you slice it, the kids will eat every bite!! The cream cheese really gives the Jello a great flavor, too! Not sure if you still check this post, but I wanted to try and make these for my daughters birthday party. Yours look beautiful! Is there a trick to getting all the layers even? Is there a trick to getting the cool whip l;ayer to spread evently or does it spead out a bit since its mixed with the liquid jello? And how much cool whip do you mix in for each layer? Not sure how y’all got this to work…. Didn’t work for me at all!!! Looked like crap! It does take quite a bit of time to make sure each layer is set before adding the next layer. Where did you get these glasses or cups? They are beautiful! How far in advance can these be made? Is the cool whip thawed or frozen?